The younger Winchester brother keeps his accessories pretty light, even lighter than Dean. Sam will sometimes wear a bracelet, sometimes not, but always seems to be wearing a watch. Like Dean, Sam doesn’t just have one watch he wears throughout the entire show. However, there are a few watches that show up quite a bit. It seems like all of Dean’s watches are rugged/military style. Sam has some watches like that, but he also wears some nicer watches too. ​The Suunto Vector is like the little brother to the Suunto Core (the watch Dean is known for wearing). Check out the Suunto Vector Wrist-Top Computer Watch if you want to own the same watch Sam does. As far as I know, the Suunto Vector is his most well-known watch, but that could just be because I’m biased towards the first five seasons. The Nixon Player watch is a great example of a nicer style watch that Sam wears. You can see the contrast between all of Dean’s watches (they’re pretty much all black) and this nice silver one. 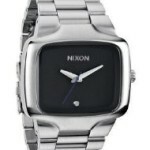 ​If you want to buy the exact watch Sam Winchester’s wearing here, its the Nixon Big Player. There are a few different styles of the Nixon Big Player watch, but that one looks the closest I think. ​If you don’t want to spend that much, you can find cheaper alternatives. It won’t be exactly the same of course, but close enough in style and look. A search on Amazon shows t﻿his Guess stainless steel watch. Like I said, not exactly the same, but the style and colors match. I’m 99% sure Sam wears more than just one bracelet, but this was the only screen capture I could find. I have no idea what the brand is, and it’s not really talked about that much. So you could go with pretty much anything here. Any generic, thin black wrist band/bracelet would do. With a quick search on Amazon I came up with this, which is actually pretty nice (and still cheap) for just a black bracelet - Konov brown leather bracelet. ​I know it’s a light list, but from all of my research, these were the only few things ever mentioned. If you know of anything else, or just have a question/comment, please let me know down below. ​Of course Sam uses a ton of firearms throughout Supernatural. Thanks to IMFDB, all of the guns have been ID'd. Sam's most used pistol is his Taurus PT92AFS​. There is an equivalent airsoft Taurus pistol on Amazon, but it's black as opposed to Sam's silver with pearl grips. Sam also uses the Smith & Wesson 5906 pistol a few times, which is a bit more generic looking pistol over the Taurus PT92​AFS. I think this BBTac airsoft pistol looks a lot like the Smith & Wesson, and even close to Sam's Taurus, just not as big. The final firearm that Sam uses quite a bit is his Ithaca 37 sawed off shotgun. There are a lot of airsoft options to choose from​. I really like this BBTac pump action airsoft, but the grips aren't brown/wood like they are on Sam's.